Born in the small town of Sundance, Wyoming, where most of the population worked as mechanics, farmers, or truck drivers. Teryn Lance was bound for something much different from the rest of his family and peers. Since he was a young child Teryn has constantly been creative. Drawing images of his grandparents semi truck and all the classic superhero’s like Superman,Batman, ninja turtles and more. even throughout grade school and high school Teryn studied art constantly. Even taking the same art classes over again just to be involved. It wasn’t until Teryn turned 19, that he decided to take his curiosity for tattoo art and the culture further and got his first tattoo at a local tattoo studio. He was instantly hooked and jumped in with both feet! Teryn went to a local tattoo studio in Spearfish,SD in 2007 and got his first apprenticeship. Later in 2012 Teryn got the chance to join Matt Thrash and began tattooing at Thrash’s Living Art Studio & Wild Idea Tattoo/Piercing . It was here that Teryn really developed as an artist and grew into a much more professional and passionate artist. For the next 5 years Teryn went to art conferences, tattoo conventions, art classes, art study, watched DVD after DVD, and burned out every YouTube video of his favorite tattoo artists tattooing, and Learned some of the basics of painting in hopes of making something great with it all. On August 1,2017 Teryn and his girlfriend (of 8 years) Amber welcomed into the world their beautiful daughter Memphis Jeane Marie. 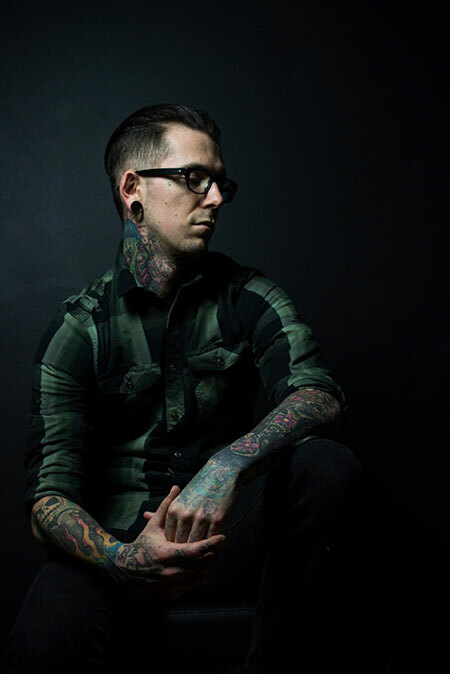 Today he focuses on using his love for art and tattooing to create high quality tattoo art and and overall amazing experience for every client that he works on. Teryn also strives to use his passion for tattoo and art be a role model for younger generations who are looking into tattooing and believes that proper education on the dangers of home tattooing and proper tattoo etiquette will help those no matter the age, experienced collectors or anyone who is new to tattoos better navigate the correct ways to go about not only choosing the right artist for them but also to help give them a sense of reassurance that they will always get quality work in a safe environment. Teryn is quiet the nerd. and loves Comic Books, Star Wars, The Walking Dead, horror movies etc. and is a huge fan/collector of oddities and the macabre. Some of a Teryn’s favorite Things to do outside of Tattooing are, Painting, being a father, Working on designs for merchandise, as well as writing and recording music in his home studio, spending time with his family and friends experiencing new and fun things, and if weather permits riding his motorcycle!!! Teryn & his family relocated to Arkansas in the Fall of 2017 to join the crew at Black Cobra Tattoos in Sherwood, Arkansas as a resident artist at the studio.